I used to say that I wrote all kinds of science fiction and fantasy except “generic fantasy” — you know, stories about wizards and demons and all that kind of guff. Well, here is my first appearance in a Martin Greenberg anthology, and what is it? A story about wizards and demons.But it’s really about software engineering. The roots of this story go back to a summer job I had in college, writing documentation for a small software company. I was the only technical writer in a bunch of squabbling programmers, and due to my position of viewing the software from the outside I felt that I had a unique understanding of the system as a whole. I turned this into an idea for a fantasy story about a scribe, working for a bunch of squabbling sorcerors, who returns years later to fix a system that nobody else alive understands. 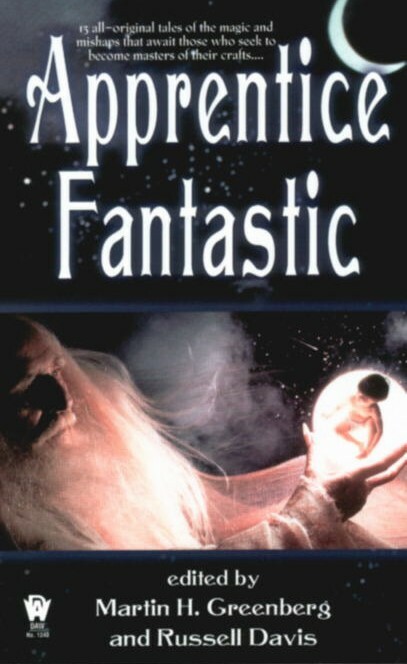 And it remained just that — an idea — for almost 20 years, until I got the chance to submit a story to Apprentice Fantastic. All I had to do was change the scribe to an apprentice and it would be perfect for the anthology. I did a lot of research on the middle ages for this story. The way Ulrich escapes from Agnes’ house came straight out of what I learned about medieval house construction, and the names are all appropriate for Germany in the 1400’s. I also researched and made up some Latin and German terms for software engineering concepts, but the only ones that survived to the final draft are tessera (Latin for “password”) and Zauberschrift (German for “magic writing” — in the story, the programming language used for controlling daemons). He pushed the crumbling door aside and ducked beneath the collapsed lintel. Inside he found dripping water, weak daylight streaming through holes in the thatched roof, and a swampy smell of mud and decay. The back half of the roof had collapsed; a heavy beam lay across the cracked hearthstone, and rotting straw lay everywhere. For a moment he just stood, taking it in, trying to reconcile this ruin with his happy memories. Johannes’ writing-desk had been there, Heinrich’s chest of herbs and compounds there. Now there was nothing but disorder and decay. Johannes’ favorite chair lay overturned in a corner; when he tried to pick it up, it fell to pieces in his hands. He flung the rotten boards away. Enough delay. There were problems to be solved here. All morning he had strained his mind, trying to piece together bits of memory. He had remembered three of Johannes’ tesserae — words of command over daemons — and hoped that would be enough. He cupped his hands to his mouth and called them out, one after another. There was no reaction to the first or second, but at the third he felt a movement in the mud and rotten straw under his feet. The three of them dragged the heavy coffer out of the sucking mud and onto the hearthstone. Ulrich cleaned the grime away from the hinges and hasps as well as he could, then rinsed his hands in a puddle before raising the lid. The large bound volume of spells was inside, as he’d hoped. But it was covered with mold and mildew. Black and green tendrils engulfed the book in a wild profusion of corruption.